I painted this in 2005. 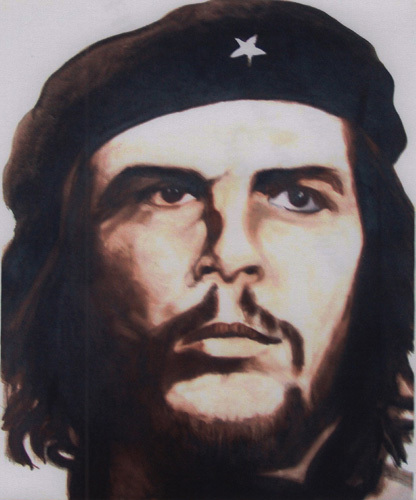 It doesn't probably require any explanation as it is an artwork made from the well known iconic photograph of Ernesto 'Che' Guevara, the Argentine Marxist revolutionary. It does however fit this weeks Illustration Friday theme, 'Mirror'....because of an error that I made whilst doing the pre drawing layout with the 'grid method' on tracing paper, he is painted as a mirror image.. I still see the Spanish buyer occasionally and I haven't actually mentioned it, although he still tells me he loves the painting. If he ever questions me, I will tell him it was a pre planned decision to make the icon my own and not the same as everybody else's...t shirts, lighters, posters etc etc. I don't usually post old work but this is also appropriate as 'Che' died almost 45 years ago to the day on 9th October 1967.
edit: I just googled this image and it seems that I am not the only person to have used this image in reverse..although the majority use it the other way! Hey, Rod, do you know one thing?, El Che (we say El Che)was born in a town called Rosario which is about 400 Km. from my home. but he lived many years here in the mountains because he had asthma, and doctors told him that he should live in a dry climate, (he was medical doctor) that house is now a museum, and is about 30 km from here. No, no, el decir "Che" es exclusivo de los argentinos, seguramente. Buena semana hombreeeeeeeeeeemañana aquí es día feriado, pues es el aniverasario de el descubrimiento de América!!! (Assuming that Colón discovered America) Un abrazo! Wow, this is something completely different from you! Funny, the mirror image does look different in some strange way though I wouldn't have noticed if you hadn't mentioned it. I think that's interesting...I don't think people notice although its one of the most famous images around. It almost makes me want to paint the Mona Lisa with a strange slant that's not noticed...only almost though. Hey Rod tengo que pedirte disculpas, yo hablé y hablé, y hablé, but I do not told you how well done that painting is, Excellent!!!! you've managed to paint the eyes with the natural expression!!!! Thanks Roberto...I think I'll have to paint this again...its actually full of mistakes and I shouldn't have sold it! Where is Gerard??!! Is he hiding in there somewhere? Seriously though, great painting! best to tell the buyer personally, methinks.